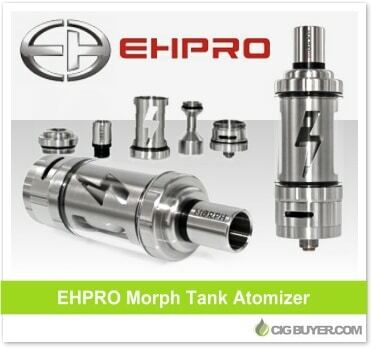 Developed by Ehpro and Eciggity, the Ehpro Morph Tank is an extremely flexible RTA and sub-ohm tank in one. Not only does it have a RBA deck to build your own coils, but it has 3 adapters for use with the most popular sub-ohm heads, including: Atlantis, Atlantis 2.0, Subtank and Delta II. The Ehpro Morph RTA has huge adjustable cyclops airflow, widebore derlin base drip tip and it’s capacity varies based upon each adapter (from 3.6ml to 5.7ml).